Compuvision Hosting Review 2019: Is Compuvision Hosting a Good Hosting? Compuvision offers a range of hosting plans (shared, managed, cloud and VPS) together with website, domain, and cloud solutions. Email and security solutions as well as some combo offers (that merge two or more of its existing plans) are some of its other offerings. Compuvision aims to become a one-stop shop for global clients looking for a variety of hosting, website (domain registration and transfer, website builder, themes and plugins etc. ), email, and security solutions. The company’s globally distributed datacenter has redundant server infrastructure. Since its servers and IP addresses are white-labeled, they can’t be traced back to Compuvision. The company’s website supports English. However, its customer area supports twenty-five other languages. Compuvision offers shared hosting (Linux and WordPress), servers (dedicated, Linux KVM VPS, windows dedicated, and managed), cloud hosting, and resellers (Linux and Windows). It also brings several security solutions (SiteLock, SSL, and CodeGuard’s cloud backup), website building and design solutions (Weebly, Impress.ly, themes and plugins for Joomla, Magento, Prestashop etc. ), and email solutions (G Suite, business and enterprise email) for its customers. The company offers 99.9% uptime guarantee for its web and reseller hosting plans. Compuvision offers four Linux shared hosting plans – Linux Plus 100 GB, Linux Plus Ilimitado, Linux Multidominio D3, and Linux Multidominio DI. The entry-level plan provides a single domain together with 100 GB disk space and 1000 GB data transfer. The other three plans offer 1, 3, and unlimited domain respectively. All these higher plans come with unmetered disk space and data transfer. However, all four plans have unlimited email accounts on offer. In case you want to opt for WordPress plans, Compuvision has four plans on offer – Starter Lite, Performance Lite, Business Lite, and Professional Lite. Though you can’t call Compuvision’s shared hosting plans the cheapest, they are still priced competitively, which makes them a good choice. You can try them without any worry since the company offers a thirty day money-back guarantee. The Linux plans are payable on a 1-year, 2-year, or 3-year term (though the two higher tier plans can also be paid every 3 or 6 months) in USD, GBP, AUD, CNY, CAD, EURO, INR, TRY, RUB, or COP (Colombian Peso). The WordPress plans too have similar payment terms though they can be paid on a monthly basis as well. You can reach Compuvision’s support staff via phone, Skype, email, or a ticket system. However, the company specifically mentions that its phone or Skype id is used to communicate only when it’s impossible to resolve their existing or potential customers’ queries through tickets. I raised a ticket for a general inquiry, but failed to elicit any response within twenty-four hours, which was perhaps obvious (for being a non-customer). Since the company serves global clients, the absence of a 24/7 live chat option was a downer for me. Compuvision’s FAQ section can be of great help for those who believe in taking the DIY route to troubleshooting and getting their questions answered. For competitively priced and user-friendly shared hosting plans, Compuvision can fit the bill just fine. Optimize your online presence with Compuvision’s hosting plans. 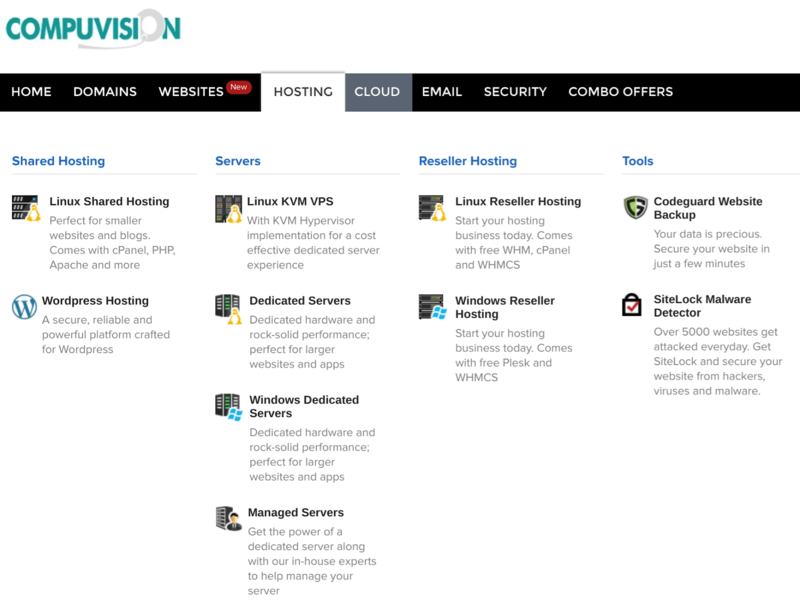 Wondering how Compuvision Hosting stacks up against other Web Hosting companies? Enter any other Web Hosting company and we will give you a side-by-side comparison.